Jovanka Beckles served as a Richmond City Council member since 2010 and Richmond Vice Mayor since 2016. Jovanka has long been a strong advocate for progressive causes. Always an avowed corporate cash-free candidate, she stood resolute against the Chevron Corporation's attempt to take over the Richmond City Council race in 2014 and helped win many concessions from Chevron, including a $114 million revenue agreement with the City. She went on to lead a City initiative to fight crime and violence by integrating formerly- incarcerated individuals back into the community. Her "Ban the Box" ordinance prevents the City from disregarding applications for City employment because of previous incarceration. Vice Mayor Beckles also introduced the Richmond Municipal Identification Program, strongly supported by the Chief of Police, as a tool to improve police-community interaction. Consequently homicides have gone down in Richmond by 66%. She is also a strong advocate for Black Lives Matter and immigrant and LGBT rights. In 2015 Jovanka Beckles ran for State Assembly, District 15. The success of the Richmond Progressive Alliance (RPA) in advancing an anti-corporate agenda with limited, grassroots resources “is virtually unheard of in American urban politics,” a political scientist at San Francisco State University told radio station KQED. In 2016, the RPA was the driving force behind California’s first new rent-control measure in 30 years. The RPA has also consistently outmaneuvered Chevron, whose refinery in the city is a major employer. In 2014, for example, the company spent $3 million to defeat three RPA members in their bid for the Richmond City Council. They all won. As an RPA and City Council member since 2011, Jovanka Beckles, 55, has been immersed in these battles. Her movement roots give her the potential to exert real influence in the Democrat-controlled California State Assembly, where the establishment and progressive wings are locked in a struggle to define the party. Endorsed by Democratic Socialists of America, Our Revolution, SEIU California, Working Families Party. With Keith Brower Brown, Abigail Gutmann-Gonzalez, Andrew Richner, Alex Schmaus, Jovanka Beckles and Noemi Tungui. DSA is proud to announce national endorsements for four more candidates today. East Bay Democratic Socialists of America worked on three electoral campaigns in 2018: National DSA endorsee Gayle McLaughlin, running as an independent for lieutenant governor; Jovanka Beckles, an East Bay DSA member running for state assembly; and a ballot initiative to repeal state-imposed limits on local rent control. The three campaigns fit together nicely: When McLaughlin and Beckles served together on the Richmond City Council, they helped pass the state’s first new rent control measure in 30 years, inspiring housing activists in other cities around the state to follow suit. 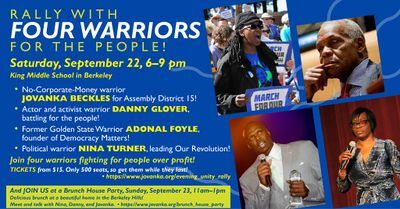 East Bay Democratic Socialists of America (DSA) is celebrating the primary victory of DSA member and Richmond City Council Member and Vice Mayor Jovanka Beckles, who will advance to the run-off election for California Assembly District 15 (AD15) in November. With some ballots still remaining to be counted, Beckles has clinched the second place slot over Oakland City Council Member, Dan Kalb, who conceded this afternoon. Without financial or political backing from corporate interests, the Beckles campaign relied instead on support from DSA, Our Revolution, and Richmond Progressive Alliance. Based on her record of passing the first rent control law in California in decades as well as "Ban the Box", and leading the way in forcing Chevron into compliance with environmental and worker safety standards, Beckles has organic support from the working people of the East Bay. She is strongly committed to repealing Costa Hawkins and implementing rent control and affordable housing, passing single-payer healthcare, and funding education by closing corporate tax loopholes. DSA organized 250 volunteers who knocked more than 8,000 doors in competitive AD15 neighborhoods, made 2,500 voter turnout calls and canvassed thousands of voters in public locations ahead of the primary. DSA directly turned out 750 supporters and influenced thousands more to vote for Beckles, who has been declared the winner with a narrow 300 vote lead over Kalb. This electoral success builds on recent DSA-backed political victories, including 18 DSA members elected in 12 states last November, four DSA-backed Pennsylvania state House candidates who won their primaries in May, and the June 5 success of San Francisco's DSA chapter in campaigning for Proposition F, guaranteeing right to counsel for tenants facing eviction. Beckles will face Buffy Wicks in November. Wicks is a corporate-funded, Democratic Party careerist: a former Hillary Clinton 2016 campaign director and newcomer to AD15 with no experience as an elected official. Far out-spending all her opponents in the most expensive primary race in the district’s history, Wicks raised more than four times as much as Beckles to fund a massive primary operation, demonstrating the power that corporate elites and the Democratic Party establishment can wield in our political system. The Govern for California PAC, which was founded and is funded by Walmart Chair Greg Penner, tech investor Ron Conway, and David Crane, former advisor to Arnold Schwarzenegger, alone poured half a million dollars into campaigning for Wicks. "Going into November, DSA calls on working people and progressive organizations like the Richmond Progressive Alliance, labor unions, tenants rights organizations and environmental activists to build the movement that can stand up for working class interests. DSA sees a clear choice between a candidate for and by working people on the one hand, and Buffy Wicks, who is for and by corporate donors and the Democratic Party establishment. When Jovanka is elected to the legislature, democratic socialists, unions, and progressive activists will continue to fight alongside her against corporate greed to carry on Bernie Sanders’s political revolution and grow the movement that can transform our society into one that puts people over profits." With just 182 votes separating DSA member Jovanka Beckles from Dan Kalb in Assembly District 15, we still don't have final results from yesterday's primary - but we do know that our work on this campaign has been a win for democratic socialism and the working class! Despite being up against corporate-backed candidates flooding the district with their message, Jovanka managed to out-perform two ... See More — with Luke Thibault, Ashley K.I. Payne, Keith Brower Brown, Ruscal Cayangyang, Soli Alpert, Jamie Gardner, Melissa Martinez, Michael Webbon, Andrew Richner, Abigail Gutmann-Gonzalez, Sean Murphy, James Nye, Elsa Chinea Stevens and Gabby Martinez. With Bernie Sanders, Jeremy Gong, Barbara Lee and Jovanka Beckles. Alyssa Kang September 14 2018. With Jovanka Beckles, Melvin Willis, Eduardo Martinez, Malinda Markowitz, Jonathan Wright and Scott Hutchinson. This page was last modified on 1 February 2019, at 04:37.